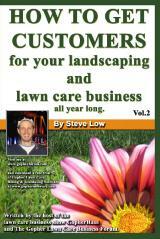 « Lawn care postcards and why they are a good form of marketing. Do you include a stop charge in your lawn mowing estimates or do you estimate the amount of time the job will take and create a bid based on that number? 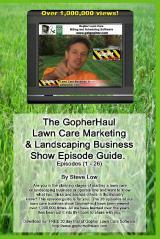 If you find you have a hard time coming up with a bid price, this discussion from the Gopher Lawn Care Business Forum will offer you another option. A simple calculation based on the size of the property can help you come up with a pretty consistent lawn care estimate. A second business owner responded “I charge $1.10 per 1,000 square feet and add a $14 stop charge. The stop charge pays for me to get there, unload and reload equipment. The price is fixed and does not depend on the distance of the customer’s property. It’s how I base my minimum pricing. I have a similar formula for fertilizing: (sq. ft./1,000) x $3 + $18. That would make my minimum fertilizing charge $21. To minimize my service area I have my business phone number as a local number and not toll free. So the calls I get are from people living around here. This filters out callers from areas outside my service area. I’m not driving a truckload of equipment to any far off location to mow a lawn for any reason. The time you spend behind your windshield driving is time you are not making any money. The biggest distance I travel is about 13 miles from base but it’s only 4 miles from another stop. Though I should point out theoretically distance isn’t really an issue if you cluster jobs. Sometimes it’s hard, but what I try to do is if someone from one area of town calls, I tell them I’m only there on a certain day of the week. Most customers want their mowing done on Friday for some reason but I’m only on the north end of town on Friday. If someone from the west end calls, they get placed on Wednesday or Thursday. New customers just get routed according to their locale. Having a stop charge worked into your bid price does two things, it creates the minimum price mentioned already and it also keeps the price on a really large job, realistic. Using my lawn mowing estimation formula of (sq. ft./1,000) x $1.1 + $14. It gets less realistic the bigger the lawn gets. 50,000 sq ft lawn = $250 < - would you pay that? As you can see, the stop charge keeps a nice balance between too little and too much. It’s all about the time it takes. Of course you’ve got to weigh the cost of living in your area. It’s been a bit economically depressed around here for a while since we lost the major employers of the area. In the past, I have experimented by charging based on my time spent mowing a lawn but have found that it’s not a constant number. The time tends to change every week. I can be tired one week, or the lawn can grow 12″ since last week causing me to mow slower to not miss anything. The mower could run out of gas in the back yard forcing me to walk back and forth across the lawn 3 extra times or I could snap a belt. As you get to know each lawn better, you should be able to mow it a bit faster. The first time you mow it, you won’t know the most efficient way to weed whack. Then over time, you’ll discover a few patterns around the shrubbery that allow you to cut a few minutes off of your time. Basically, sq ft = time, or it should, but there are no guarantees. My formulas are just for me. I’m not suggesting that anyone else use my exact numbers or that you’re wrong if you disagree with my pricing. You’ve also got to take into account your area’s general cost of living. The cost in my area may be much less than the cost to live in other more populated states. You will need to find a pricing equation that works for you in your area. Quite possibly, you can use my equation as a starting point to develop your own. I figured out the importance of using a stop charge when I interviewed the local lawn care business owners in my area before I got my business started. To explore the possibility of starting my own lawn care business, I worked for one and helped 2 others when I was off and they needed help. Drive time between jobs gave me the ability to chat and ask questions about how they ran their business. The common factor in their pricing for all of their services was the ’stop charge.’ I never gave it another thought until I went out on my own and started trying to come up with pricing. I tried to make it work other ways and the stop charge was the only way I could make it work. It all began to make sense why they all did it that way. [(man hours * hourly Rate) + (material cost * profit margin + delivery)]. Unfortunately, man hours almost always need to be estimated in advance. That is where most business owners blow their chance of making a profit on a job, by underestimating the amount of time the job will REALLY take. This entry was posted on Thursday, May 2nd, 2013 at 6:11 pm	and is filed under Fertilization, How to Estimate - Services To Offer, How to Estimate Jobs, Landscaping Business, Lawn Care Business, Lawn Care Customers, Lawn Mowing, Mowing, Pricing, Start up. You can follow any responses to this entry through the RSS 2.0 feed. You can leave a response, or trackback from your own site.